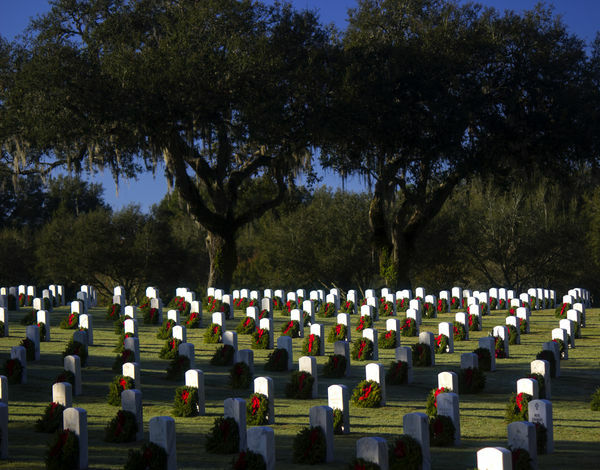 December 14 th, over 14,000 wreaths were laid upon the graves of our honored Veterans at the Ft. Smith, Ar National Cemetery by over 500 locals citizens who fluffed up and attached new red ribbons on Friday the 13 th . These wreaths will be on untill after the first of the New Year and then removed and stored till next year. There were many small children there arm's filled with wreaths as their parents ( or parent) placed the wreaths. Memorial day Students from Darby Jr.High School are selected to place flags on each grave (which is quite a honor to those selected) Darby is famous for the Darby's Rangers, many of which are buried here. Merry Christmas to all those who have given their time and lives for us all and to their family's to serve and protect our Country and all of those currently serving and their loved ones at home . In Bushnell, right? I've never been in the cemetery itself - I may have to take a trip there next year. Very pretty. I know Walmart gets vilified a lot - this is a very touching deed done for the community.